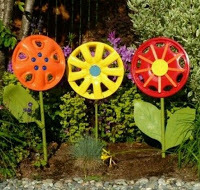 Stop by the Library to see our beautiful garden artwork up for bid in our Friends Garden Art Silent Auction. Bidding goes through April 20th. You can call PetData at 1-855-312-9070. License(s) will be mailed within 10 business days of PetData's receipt of payment and documentation. Representative Dianne Hesselbein will be conducting listening sessions throughout the 79th Assembly District in the upcoming weeks. “As we begin the biennial budget process, it is important for legislators to be accessible to their constituents. I hope to have great discussions with my constituents on budget issues and other legislative matters. When I have the opportunity to hear directly from people living in the 79th Assembly District, I have a better understanding of the issues people are faced with on a daily basis," said Representative Hesselbein. The Waunakee Community School District has made a financial commitment to start a Student Financial Assistance Fund that can support families in need. The district is committed to ensuring that all students and families can participate in their school community regardless of a family’s ability to pay. A district-wide committee, including representatives from the Board of Education, administrators, staff, and students, has been created to establish guidelines for this initiative. 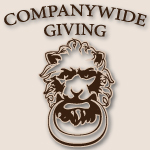 They are seeking the community’s help in raising the necessary funds. The goal is to raise $25,000. Waunakee Area EMS is Celebrating 40 years! In 2019 Waunakee Area EMS will be celebrating 40 years of volunteer service. 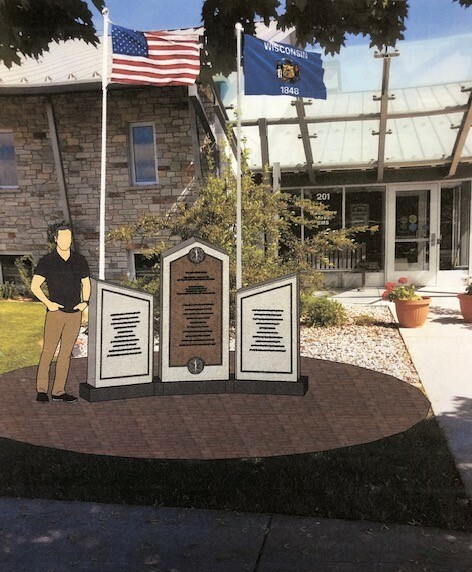 The WWDDVS (Waunakee, Westport, Dane, town of Dane, Vienna and Springfield) Commission has approved a project telling the history and honoring volunteers. The monument project includes three stones. The middle stone tells the history of the service, the two sides list volunteer members who served 15 or more years to the EMS district. Project costs include the monument, landscaping, moving flag poles, lighting, maintenance and updating the monument as names are added. 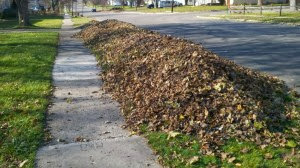 Waunakee Area EMS is hoping the community will support the effort. Presentations can be given. For more information, please call Vaughn Frye at 849-7399. Waunakee Utilities staff will soon be installing electric and water meters for Waunakee residents. Waunakee Utilities will be having several people from their electric department going through the service territory over the next couple months with a large wagon carrying boxes of electric meters. Staff will be changing out all electric meters and will be going to every home and business to do this. The water department will be contacting every customer over the next +/- four years as part of a water meter change out project. Water department staff will need to access the meters which are generally located in the basement of homes and businesses in order to install a new meter. 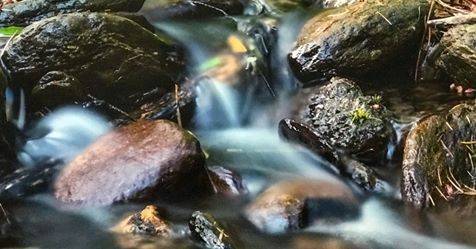 The Town of Westport is part of the Madison Area Municipal Stormwater Partnership and as part of their stormwater permit they are required to undertake information and education. Storm drain murals were part of that education element this year. Check out the poster HERE featuring Waunakee and Westport drain murals. Have you seen the cool mural near the intersection of Woodland Drive and Mill Road in Westport? Thanks to Jessica and Barry from the Town for heading the project for Westport and Christal Campbell at the County for coming up with the neat idea! Connecting to the Village of Waunakee continues to be convenient since the 2017 rollout of the Village of Waunakee Mobile App (MyWaunakee). Currently available in both the Apple Store and Google Play Store, information like news alerts, job postings, Village Board information, and events and meetings are now at your fingertips. The application, designed to make connecting to your local government more seamless, allows users the unique ability to report a concern (ex. street light out), attach relevant photos along with map location, and connect to the appropriate staff to easily address concerns. To download the MyWaunakee app, follow the links below or simply search for “MyWaunakee” in either the Apple Store or Google Play Store. 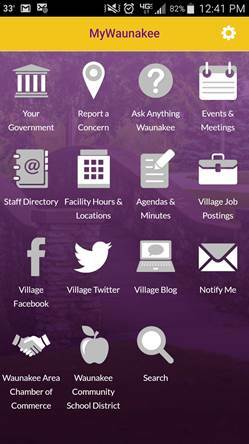 For more information about the mobile application, please contact Adam Bentley, Assistant Village Administrator at abentley@waunakee.com or by phone at 608-850-2182. If you would like to watch a quick demonstration of the application please visit the Village’s YouTube Channel at https://youtu.be/WzqD1j0fV7A. Thank you to everyone who attended a community conversation or focus group last month to talk about Waunakee’s Creative Economy Initiative. To keep community members in the loop about our work, we launched a new e-newsletter! Read the first e-newsletter now, and sign up to receive future updates via the link at the end of the e-mail. The Village of Waunakee is excited to release the 2017-2018 Village of Waunakee State of the Village presentation given by Village Administrator Todd Schmidt. The video, which takes less than 10 minutes to watch, briefly highlights the past several years of Village progress and provides a snapshot of our current financial conditions. Please take some time to watch the video and if you have any questions, please do not hesitate to contact Todd at tschmidt@waunakee.com or 608-850-5227. You can also access a PDF copy of the presentation below. Registration Technology Inc. (RTI) is an authorized partner of the Wisconsin Division of Motor Vehicles and is pleased to announce that EZ-TAB is now available at two locations in Waunakee. EZ-TAB is an easy to use self-service kiosk that will renew your Wisconsin license plate, dispense your vehicle’s registration and license plate sticker (tag/tab), all in real time with the WI DMV. EZ-TAB gives you everything you need instantly. EZ-TAB is paid for and provided by RTI at $0 cost to the DMV or the State of Wisconsin.